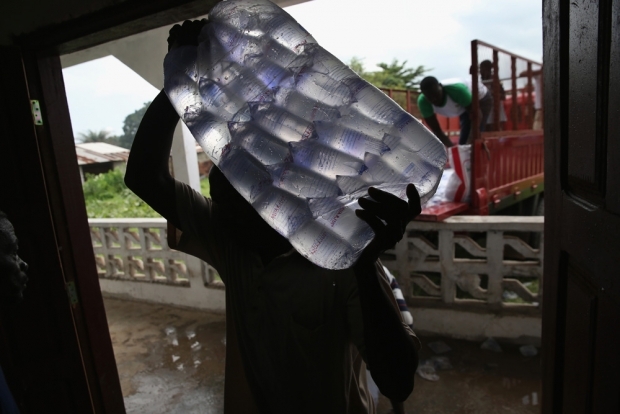 Volunteers carry bags of water for distribution on August 23, 2014 in Dolo Town, Liberia. The government has been slow to deliver sufficient aid to the rural town of some 20,000 people, following an August 20 quarantine to stop the Ebola epidemic from spreading from the community. China appears to be leveraging the Ebola crisis in West Africa to radically improve its controversial foreign aid record. In contrast to Western countries, many of whom have evacuated their medical personnel from the region, China has sent teams of experts along with millions of dollars in badly needed medical supplies. Their efforts appear to be paying off in the eyes of African public opinion, demonstrating that China’s commitment to the continent extends beyond the perception of a calculated mercantilist agenda. In this edition of the China in Africa Podcast, Eric and Cobus discuss the implications of the ongoing Ebola crisis on Beijing’s public diplomacy in Africa.